Ada pertanyaan untuk St.Olav Hotel? St.Olav Hotel, terletak di Kota Tua Tallinn, adalah pilihan yang populer bagi para wisatawan. Dari sini, para tamu dapat menikmati akses mudah ke semua hal yang dimiliki oleh kota yang aktif ini. BiiT Me Record Store, Vene galerii (Russian gallery), Museum Sejarah Estonia - Hall Great Guild dapat dicapai dengan mudah. Setiap upaya dilakukan untuk membuat tamu merasa nyaman. Dalam hal ini, properti menyediakan pelayanan dan fasilitas yang terbaik. Ketika menginap di properti yang luar biasa ini, para tamu dapat menikmati akses mudah untuk kursi roda, resepsionis 24 jam, tempat parkir mobil, layanan kamar, restoran. 78 kamar yang tersebar di 5 lantai memberikan suasana hangat dan menyenangkan ketika Anda jauh dari rumah. Kenyamanan seperti televisi layar datar, ruang keluarga terpisah, akses internet WiFi (gratis), kamar bebas asap rokok, AC dapat di temukan di beberapa kamar tertentu. Bagi Anda yang menyukai aktivitas kebugaran atau hanya ingin bersantai setelah beraktivitas sepanjang hari, Anda akan dihibur dengan fasilitas rekreasi kelas atas seperti taman. Apapun tujuan kunjungan Anda, St.Olav Hotel adalah pilihan menginap istimewa di Tallinn. We have to wait for exactly time for all bookings to check in (14:00) that means this time will be long long line with someone is waiting for check in. For us it took 45 minutes for waiting in the line and line was long out of the hotel. No word from receptionist. He didn't give us form to fill while we were waiting. When we asked for some information like where we can take blue train to see around the town, they don't know (I asked 3 differences of them). I think receptionist should know this kind of detail. Room is ok-- quit clean. I think location is the best for this hotel. While the building certainly looks grand and the location is great, the standard of the rooms is certainly not up to par with a 4 stars hotel. The rooms are without windows, small, smell bad, you can't open a door without hitting furnitures, and the beds have deep trenches in the middle from too many years of use. Several of the electric plugs in my room did not work. The location is fine within walking distace from main tourist attractions. Breakfast is also ok. However, my room smelled sewage so bad and there were mosquitos. When I said I wanted to change the room after 10 min I checked in, the young lady with long black hair said no because because my bed is dirty for I already lied on! I felt like I was a DIRTY person. Moreover, she answered me in a really rude manner. Room was good apart from the very thin walls. This means you can literally listen people walking on the corridor and passing by your room. You can also listen to residents living above you walking in their room or the person next door using the shower. No heater in bathroom. Big windows in room but they can't be locked properly. 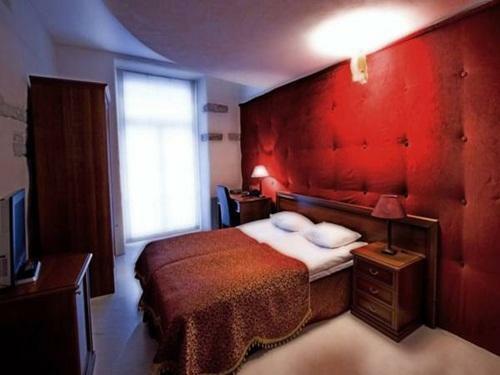 Apart from the above, hotel located in a very central location in the old town, close to everywhere. Cant rate anything except position very good. This was the worst hotel on our whole trip of 2.5 months.Room was small sub standard all round .breakfast was poor. noise all night bang bang from basement night club till 5 am, no A/C Room access for baggage very poor the worst hotel we experienced. Terrible! 1, Smelly bathroom 2, Rude and impolite staff in this hotel. He intruded into our room when we out for lunch without asking for our approval. I think it's horrible thing and he shouldn't do that after we already checked in, even though he just wanted to fix the lamp bulb. It's about the secure and privacy. Very centrally located hotel in Tallinn old town. The hotel quality really isn't 4 start but about 3-. If there happens fire in the hotel it would be very difficult to escape because the hotel is an old wooden house and not so well planned for emergency. The rooms were very basic. Staff were okay. Our stay in the hotel was very nice and cosy. A perfect hotel for coples who like good restaurants, bars and pubs near by. The history of the city is touchabull in this hotel. A pleacent stay. I will by back. 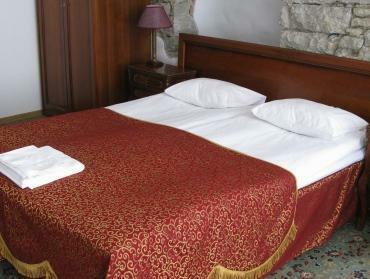 Great location in the old city, very warm room with hot showers and a huge breakfast in the morning! This is a very old historic building situated right in the heart of the old town & only a short taxi ride from the ferry terminal. The building is from the 15th century so the stairs leading to the upper floor rooms are a little narrow but this only adds to the character. 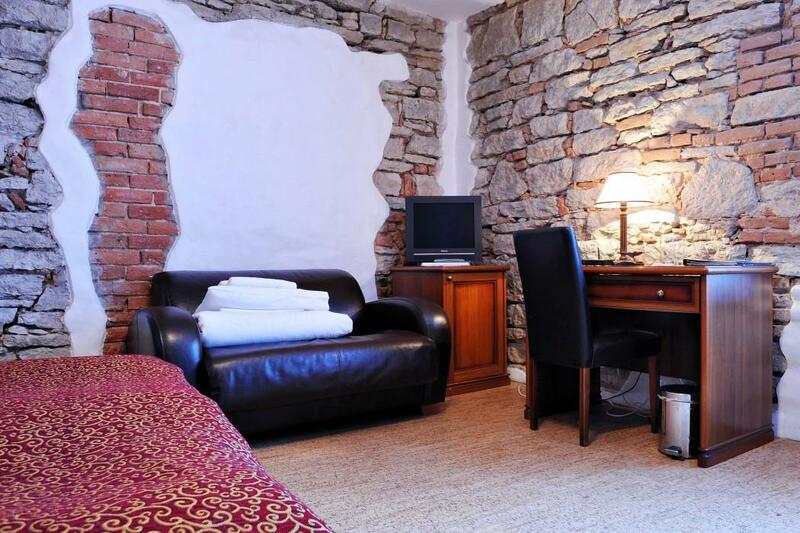 The room is spacious with plenty of hot water & wi fi is free and available in the room. Breakfast is situated in a lovely historic room containing many paintings depicting past scenes. Breakfast is very plentiful with a variety of hot and cold choices. The reception staff were extremely helpful on check out. We have no problem recommending this hotel. Nice design. Fire place in the room. Good breakfast. No elevator. Both girls on reception were unfriendly - no smile, no talks, no welcoming. The hotel was old and had nice interior but we came so late so we got the rooms in the fifth floor and as there was no lift this was a small problem. The stairs up where narrow and quite steep. Otherwise I enjoyed my stay at this hotel. the room was really small but hotel looks nice compared to price. (especially i did love atmosphere of the hotel!) and i enjoyed the breakfast as well. Really small room and the window was around the corner. The stairs upstairs are really narrow and no lift. No parking. Location is perfect, everything is close to the hotel. 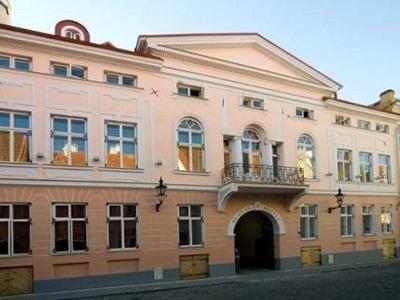 The hotel is situated at the centre of old town and convenience to do sightseeing. The room was small but clean. The breakfast was good. This hotel is located at the centre of the Old Town Tallinn. The staff of the hotel is very friendly and helpful. My husband and I were first offered a room on the Ground Floor with a window facing the street. We couldn't open the window because of security, however, it was so hot within the room even we were provided a small fan. The staff was so kind and he exchanged another room on the 3rd Floor to us. If I visit the beautiful Tallin again, I will not live in this hotel unless they provide air-conditioned rooms.